“Our continued success as a Bank depends on the Bank fulfilling its mandate and objectives and all the Bank staff deriving personal satisfaction from working for the Bank. 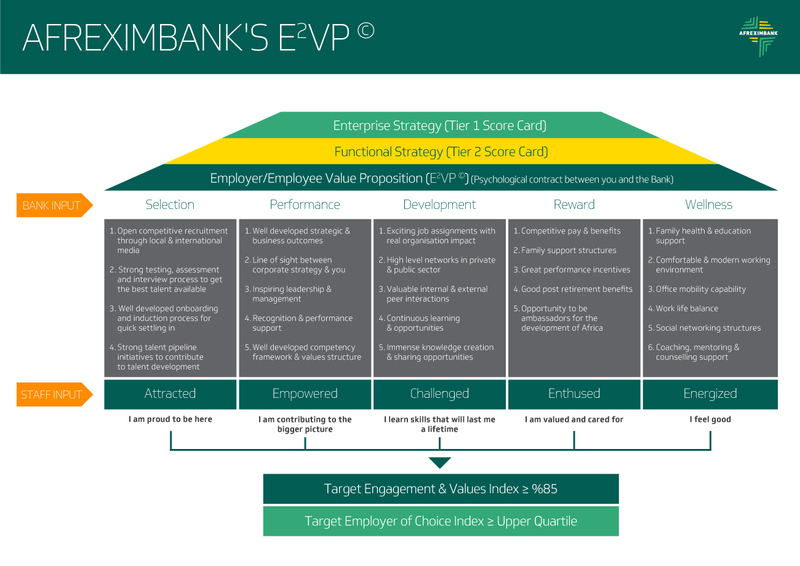 It is therefore my pleasure to share with you the Afreximbank Employer/Employee Value Proposition (E2VP). Our success is based on our people. We recruit competent and motivated talent from across the world who share our values, in order to drive excellence and professionalism in our Bank’s outputs to stakeholders. We strive to structure our operations in such a way that people can be inspired and empowered throughout the organisation. We expect everyone to promote communication, teamwork and to demonstrate leadership and commitment to drive the trade development agenda of the Bank. We provide opportunities for the development and advancement of our people. We provide exciting job assignments where they can learn new skills that will last them a lifetime. We offer opportunities where they can challenge themselves by setting the bar higher every time, while providing support to achieve things that may seem to be impossible. We value and care for our employees. We put a high emphasis on reward. We treat each other with respect and dignity and expect everyone to promote a sense of personal responsibility. We are guided by that to ensure that our actions make a real difference on the continent. We want our people to feel good. We are committed to providing a safe and pleasant work environment, as we aim to provide for employee well-being throughout our business.